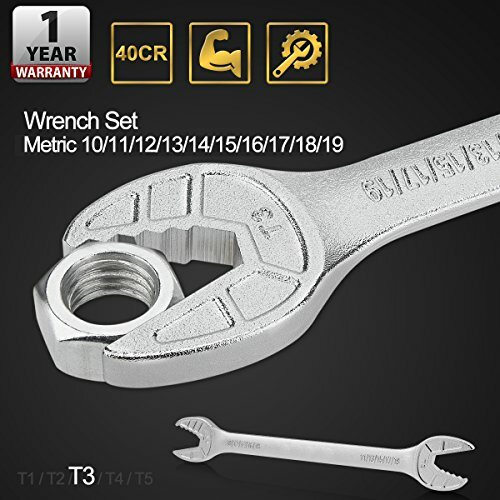 Double Open End Wrench, Ratcheting Wrench Set Metric 10/11/12/13/14/15/16/17/18/19 Ratchet Wrenches, Ratcheting Open End Combination Wrench Perfect for Repairing Bicycle, Car, Each MachineryT-3 by Hongwei at Lazaranda Dallas. Hurry! Limited time offer. Offer valid only while supplies last. Why choose our open end wrench? 1. High quality, rust-proof, wear-proof, long service time. 2. Every open ends suit for different size nuts. 3. Why choose our open end wrench? 1. High quality, rust-proof, wear-proof, long service time. 2. Every open ends suit for different size nuts. 3. Save money, one piece of our wrench equals to six pieces of other traditional wrench. 4. Easy to carry, not too big nor too heavy, convenient to be taken to anywhere you need. 5. Fast and easy to operate, precise open ends size make it fast to tighten or loosen nuts. 6. Bring no damage to the nuts. HONGWEI Wrench is a proprietary brand registered in USA .This wrench is very practical as it can fit many nuts' size. Besides, it is constructed from purpose-made chrome vanadium steel, showing great performance on rust resistance and wear resistance. You deserve it. √【CONVENIENCE】: It can replace ten different sizes of traditional wrenches, 10/11/12/13/14/15/16/17/18/19. So this is very convenient for family daily use as there's no need to buy many traditional wrenches for different size nuts. And also it is light for carrying with. √【SPEED & NO DAMAGE】: The size of every open ends is super precise, allowing very fast and freely to tighten or loosen nuts. Different from traditional wrench, it can be fast and easy operated and bring no damage to nuts. Avoiding space restrictions and replacement dimensions, the small and easy-to-handle wrenches a can be adapted in complex mechanical fields. √【RATCHET FUNCTION】: Open end wrenches is adopted with ratcheting gear design, which can enhance the friction between the wrench and the clamped object, allowing fast twist. This is no need to repeatedly clamp. Three clamping surfaces fix the nut so that the nut does not slip off the plate mouth but to maintain more torque. √【HIGH-QUALITY MATERIALS】: The wrench is constructed a forged from high strength drop and heat treated chrome vanadium steel. The surfaces are chrome plated for corrosion resistance and rust resistance, making the wrench a long and durable life. √【ONE YEAR WARRANTY】:If you have any issue after using our open end wrench, please contact with us to get refund or replacement. We promise one-year warranty. If you have any questions about this product by Hongwei, contact us by completing and submitting the form below. If you are looking for a specif part number, please include it with your message.